Hello friends! 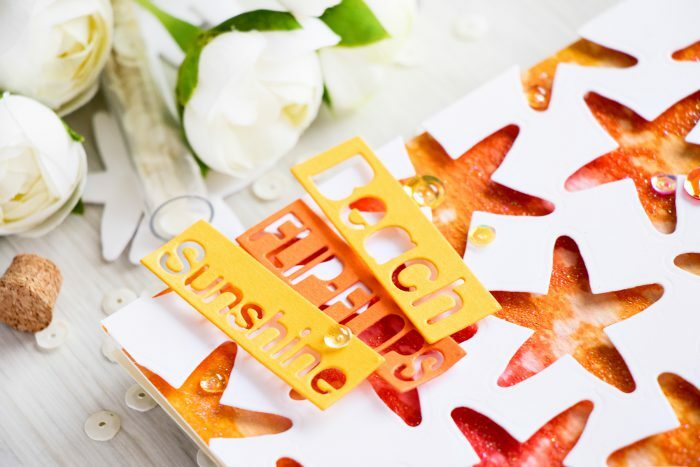 Die cutting is something I really enjoy – there are so many options when it comes to using dies and doing die cutting. 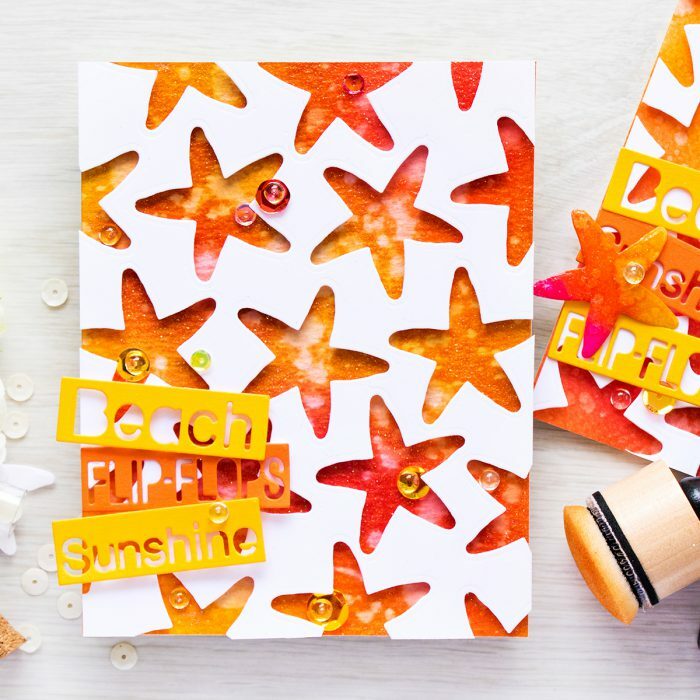 Today I’m exploring one of those options – negative die cutting and creating a negative die cut panel (with a repeated die cut image) for a hot Summer card! Grab your dies and join me! 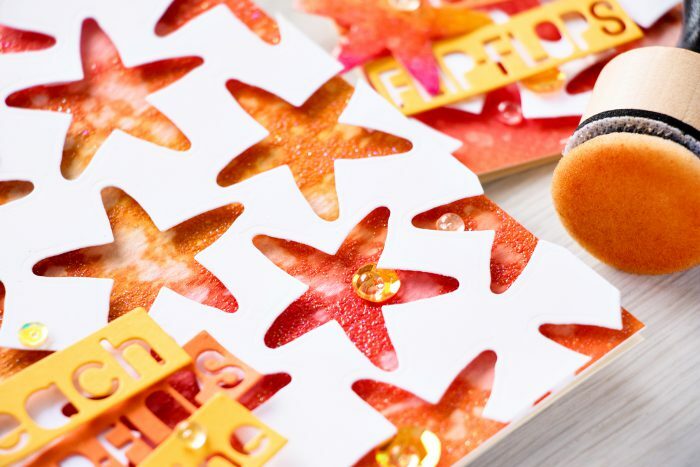 I stared working on this card by die cutting a star fish image from the Set Sail die set from Simon. This is not a stand-alone die set, but rather a set of dies that goes with a stamp set; and if you think about it, we always use our dies with our stamps. However for this card I am using just the matching die and skipping using stamps (I’m actually skipping stamps altogether – there isn’t a single stamped image on this project; everything is done with the help of dies and die cutting). 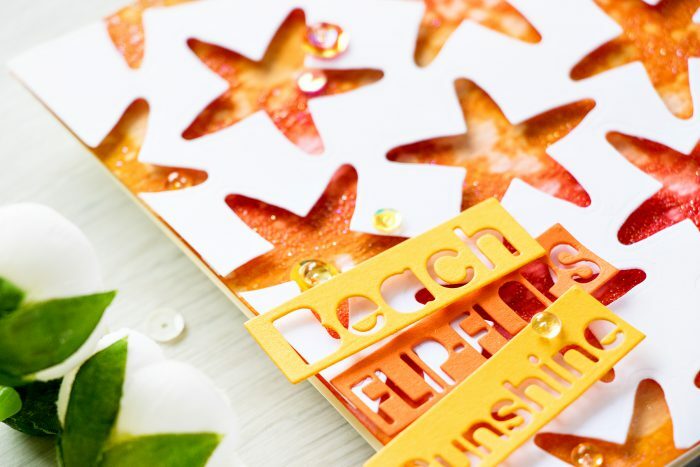 There are lots of various background dies (and I love using those for my cards), but die cut backgrounds can also be created with the help of a single individual die like this star fish on my today’s project. The beauty of using a single die is that it lets you make a unique custom background. I don’t think I’m going to use a star fish background like this more than on a few cards, so I wouldn’t justify buying a star fish background die, but since this is a single small die that I can also use as an accent or a focal point on a card – it has a different, bigger value now. I wanted to layer my die cut background over something bold and colorful, so I created an ink blended background with a bit of sparkle. I was thinking about hot Summer sand when I was making it, although I’m sure you will all agree, sand doesn’t really look like this. I used several colors of Distress ink (all linked below), mini ink blending tools and Watercolor Cardstock along with Hero Arts Sparkle embossing powder to create this piece. Watch video to see the process in detail. Its addictive and I want to try this in other colors too. 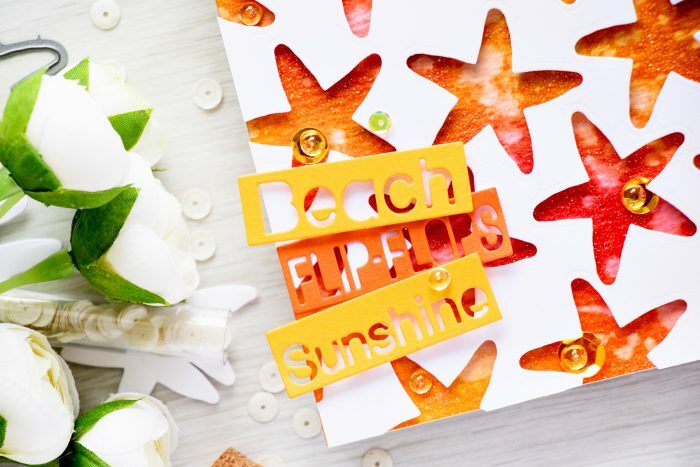 Instead of a stamped sentiment I went with colorful word blocks – Beach, Flip Flops, Sunshine. 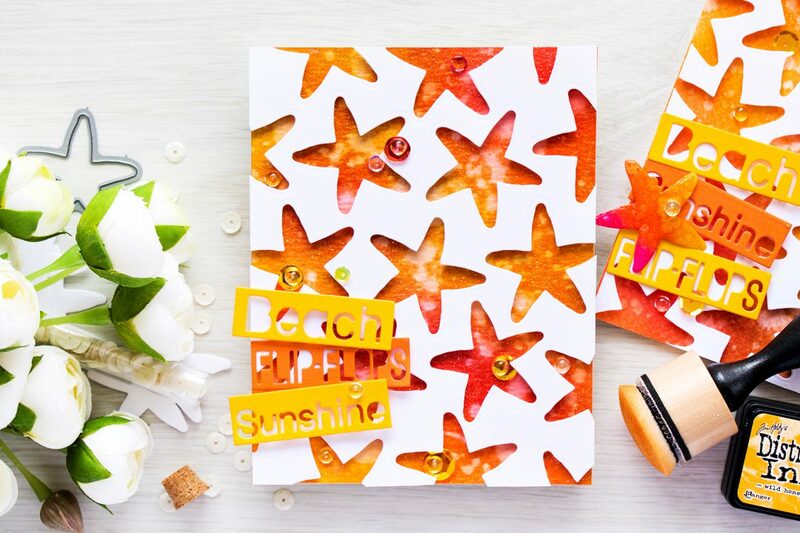 They say it all – this card is all about Summer by the sea. I have another card HERE where I used identical dies on a different style card. Of course I just had to add some sequins to this card, especially to the recessed areas – I used Simon’s Translucent mix and picked out just yellow and red ones. I also added a bunch of clear droplets from Pretty Pink Posh. So incredible cool! I have to try this technique one day! Dear Yana, your cards are beautiful! This is such a great technique with so many possibilities. I really enjoy your videos! They are always professional and inspirational! Such an awesome card Yana! I love the colors and all the texture. This die is on my wish list for sure. Thanks for sharing and inspiring. This is such an awesome card Yana, a very clever idea actually! A great card for sure, thanks for sharing it!